A few weeks ago (wait I take that back actually a few months ago… eeks that is how far behind I am in blogging) my cool peeps over at Foodbuzz* teamed up with Bertolli and asked some blogger peeps if they would like to review a couple of their new sauces. I of course said I wouldn’t mind. Bertolli shipped me this cute little box that looked like a menu. Inside were the two bottles of their new Arrabbiata Sauce and their new Four Cheese Alfredo. On the two side flaps of this ‘menu’ were 3 or 4 recipes using each sauce. It was too cute (I tried to take pictures but they didn’t turn out all that great). I knew immediately what I wanted to do with the Arrabbiata sauce. I was going to make a pasta dish since I kinda have a thing for pasta! Before I started cooking I tasted the sauce by itself.. so I knew what I was working with. The flavor was great and did not taste tomato pasty (which with some of the jar sauces they can sometimes have that lingering tomato paste taste). Also the texture was perfect and not runny like other jarred sauces. The one and only thing that disappointed me about this sauce was that for me it was not spicy enough. Arrabbiata means ‘angry’ in Italian and an Arrabbiata sauce usually has a bit of a kick. So in my recipe below I added a little bit of crushed red pepper. But if you would like to serve this to kids or you have trouble handling the heat then leave out the crushed red pepper and just use the heat in this sauce to have that ‘little’ kick. This pasta dish is delizioso! All the flavors complement each other so well. 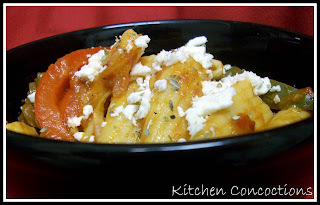 The tanginess of the feta and the spiciness of the Arrabbiata sauce pair perfectly. Add in Italian sausage and bell peppers and you have perfection in a bowl. Slice peppers and onions into long thin pieces. Set aside. In a large skillet over medium-high heat, brown sausage links on all sides. Continue to cook until sausage is thoroughly cooked all the way through. Once fully cooked, remove sausage from pan and slice. In the same pan the sausage was cooked add peppers and onions. Saute veggies for 3-4 minutes. While veggies are cooking bring a pot of salted water to a boil. Add pasta and cook according to package directions. After veggies have cooked add the sliced sausage back to the pan along with sauce and crushed red pepper. Season with salt and black pepper. Cook until heated through. Pour sauce mixture over prepared, drained pasta. 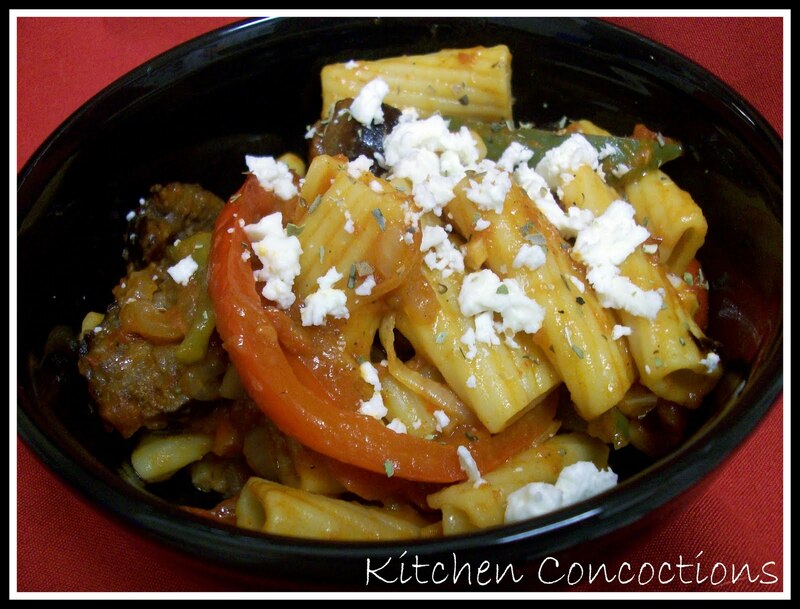 Serve topped with feta cheese. *As part of the Foodbuzz Tastemaker Program, I received the Bertolli Arrabbiata Sauce.